Does your church have an information table with clip boards and event sign-up sheets strewn all over it? Do you have people who sign up for events like dinners, trips, or youth activities but don’t have the cash on them to pay for them when they sign up? Are you constantly getting emails, phone calls and texts from people who want to participate in an event and then have to add their name and info to a list somewhere? Ever lose a sign-up sheet… er, I mean, have someone move a sign-up sheet without telling you? Better organization – Never lose a sign-up sheet again. Better accuracy – Ever get signups where you couldn’t read the phone number, email address or maybe even the name? That’s less likely when registration is done on a computer. Saves your organization time – instead of taking signups by phone, email or text, your people can sign up themselves online. Greater participation – When people can sign up anytime and anywhere from a computer, tablet or phone they are less likely to forget to signup. Send an email with a sign-up link and people can click and sign-up immediately. Online event registration works great for vacation bible school, dinners, school field trips, ministry events, general admission concerts and more! Online event registration saves time and increases participation in events. If you use our WP-EZ Website Builder, you can get online event registration as a premium plugin. Order event registration pro if you want to take payments online, or order basic event registration for everything but online payments. Want to see how online event registration works behind the scenes? Watch any of the 11 video event registration video tutorials we created. What events does your organization do? 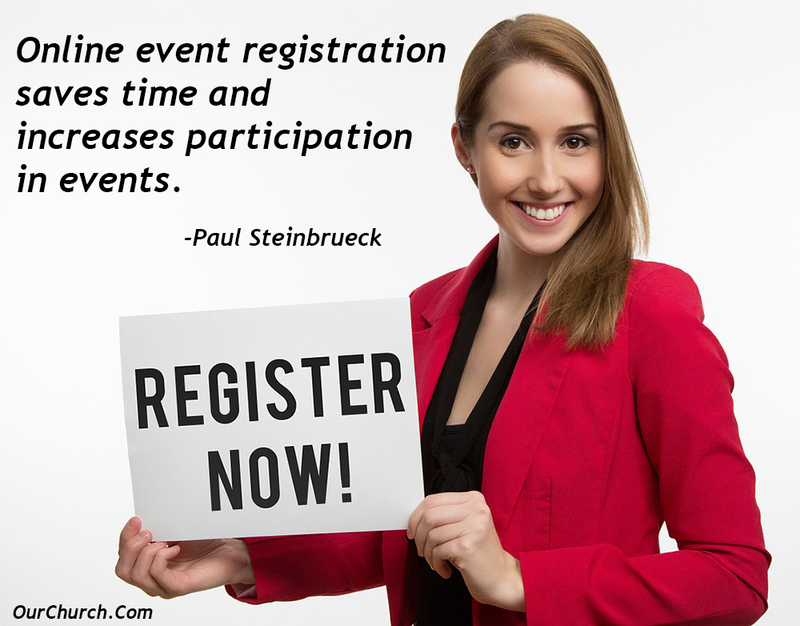 How could online event registration benefit your organization and people? This post is very helpful for event registration and payment easily thanks for the wonderful info. Thanks Paul for sharing this great effort.. keep sharing some more info like that. Good information – thank you Paul.